We want to say Happy Thanksgiving for you All! 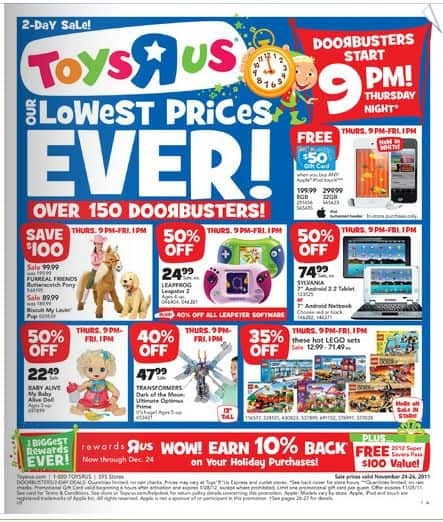 Today we got an email from Toys R Us, the email said that you could get FREE $50 Gift Card from this popular online babies store when you buy any apple iPod Touch thru Nov 25 2011. This Toys r Us ThanksGiving CyberSale deal is only valid in-store Purchase only. Quantities are limited and no rain checks. Promotional Gilt Card valid beginning 6 hours alter activation and expires 1/23/12, except where prohibited. Limit one promotional gilt card per guest. Offer expires 11/25/11. READ Can You Really Get an iPod Touch for Free?